Sometimes when craving dessert and there’s no chocolate in the house you do the next best thing – create something with whatever you have on hand. 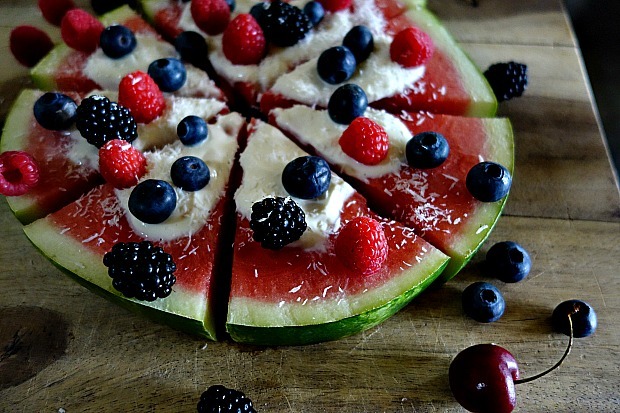 This Watermelon Pizza fit the bill. What better to have in the house on a hot blistery & humid day than iced cold watermelon? When I was trying to come up with a dessert the other evening since my sweet tooth was going crazy, I remembered I had placed a whole watermelon in the refrigerator to chill. Having the urge to be creative I decided to doctor up the watermelon a bit with fresh berries, vanilla Greek yogurt, and a sprinkling of coconut – an idea I spotted on Pinterest. The result: Much more refreshing and satisfying than any piece of chocolate I could have had, and better for me! Of course, you could cut up the watermelon into chunks, and by using the same ingredients, layer them in a jar or glass. 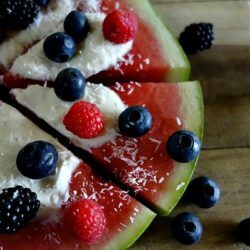 However, I think slicing a round of watermelon, and then slicing it into so called “pizza slices” then adding toppings, is much more fun and festive. Too bad I didn’t come up with this for the 4th of July, it would have been ideal! 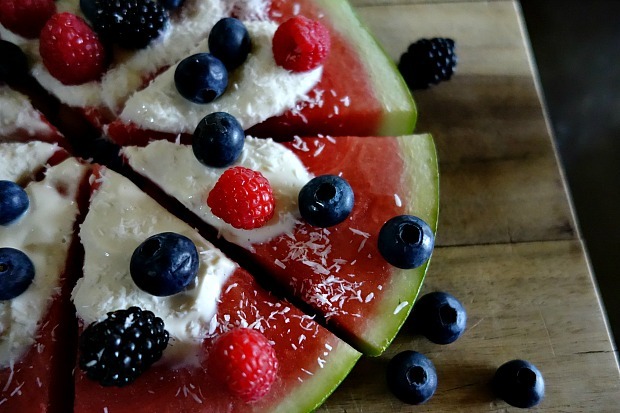 Either way this Watermelon Pizza is a delightful treat! Have it for breakfast, at lunchtime, for an afternoon snack or dessert – it hits the spot anytime of day! Having watermelon has never been more fun! 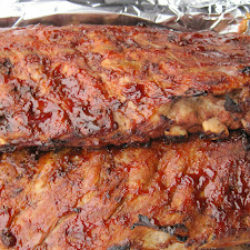 Set out on a platter, then slice into quarters, then half again to make 8 slices. 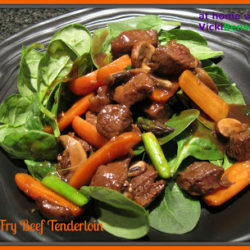 Top with Greek Vanilla Yogurt or yogurt of choice. Sprinkle with fresh berries or fruit of choice. Drizzle with coconut and Serve. 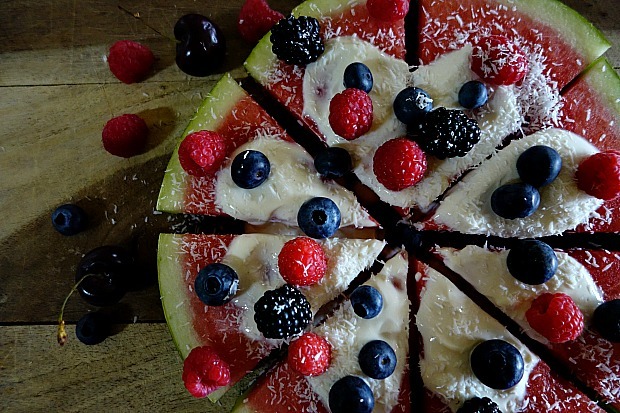 Note: Obviously if you are serving a crowd cut more slices from the watermelon, creating more pizza slices. You know how to make eating healthy loads of fun Vicki! Isn’t this fun? It’s tasty too! 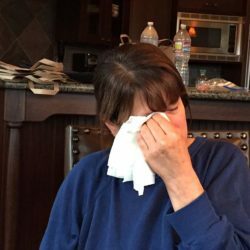 I sound like Lucille Ball! What a cool presentation! Love this healthy, yummy and gorgeous dessert! I agree, it’s so much fun looking at it on a platter and even better to indulge in! When I first saw the title I was thinking a hot dish and was wondering how the heck that was going to work. Never thought a dessert — really like the idea of this. 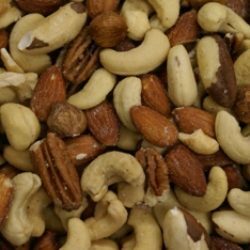 Bet you could make an appetizer version of this, too. Exceptionally creative — thanks. You definitely could make an appetizer version maybe even add some prosciutto on top and leave off the yogurt and add grilled peaches, etc, Glad you liked this! Such a fun and perfect summer treat! I love this! I’ve been eating watermelon everyday now for 2 weeks so this looks like something fun to do when I cut open the one that’s sitting on the counter. Thanks!